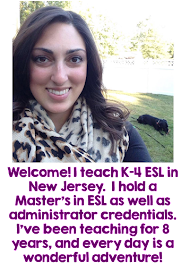 One of my goals as an English Language teacher is to give my students plenty of time to practice their skills in conversational and academic English. We start every class with a routine which provides practice in both skills. I've recently added this little gem of a strategy to my repertoire, and I love the results I'm seeing! 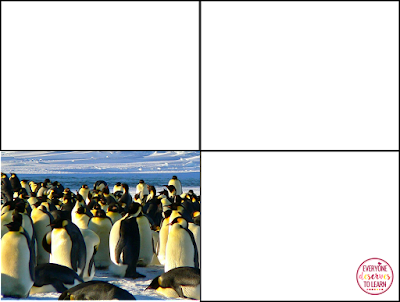 We've all used photographs as prompts for speaking and writing tasks before, but have you ever segmented the picture? That's the basis of this strategy, and it can be used in so many ways! All you need is a picture! I tend to choose images I know my students will find thought-provoking or funny. I have a Pinterest board full of images I use as prompts- feel free to use them too! Once you have an image, the fun begins. If you're doing this digitally, a program like PowerPoint or an app like Pic Collage will help you create the layered boxes. 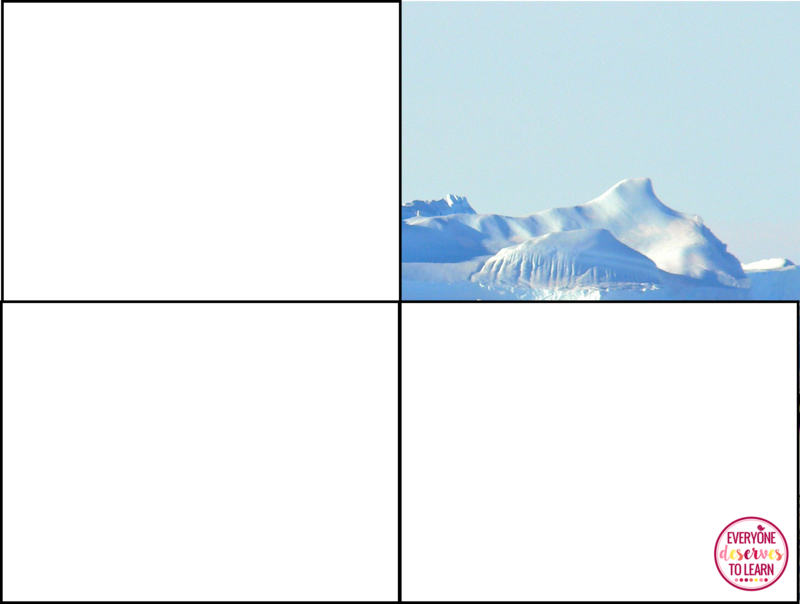 All you'll do is insert the picture, then add three boxes on top of it, leaving one quadrant blank. 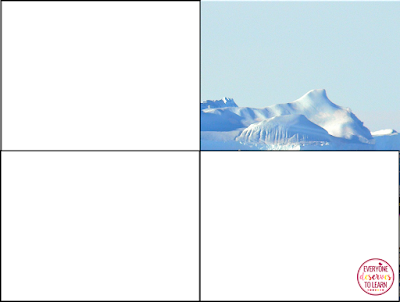 If you're printing a picture, or using a magazine cut-out, just cover the quadrants with some white index cards. 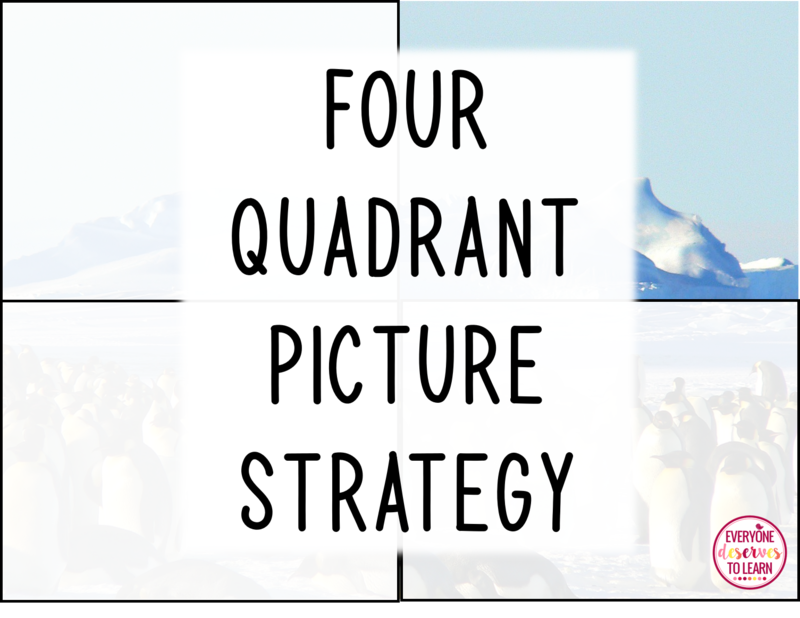 In my small groups, I've been having students work on one quadrant at a time. For example, I'll show them the above image. In pairs, the students would discuss what they see, think, feel, (you can do hear/taste if applicable) and wonder about the quadrant. Then, using a PowerPoint slide projected on my whiteboard, I slide a box up or to the side to expose a new quadrant. The students switch partners, and they discuss again. 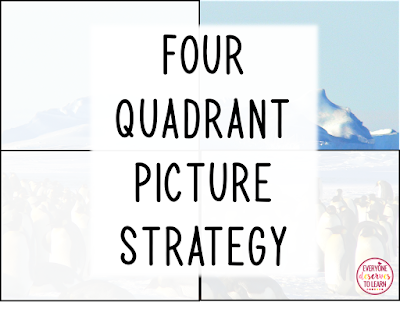 Keeping the three quadrants covered creates an air of suspense and excitement, and allows my students to really focus their attention. I use this as practice in making predictions, making observations using the senses, and discussing using academic language. By asking questions such as "What do you see/think/feel/wonder," and modeling the correct way to respond, my students can listen to and practice the fluent speaking they are working towards. Using this strategy, my students have learned how to explain their thinking using the academic language they need to be successful. Divide the class into four groups, and assign each group a quadrant. Each group is responsible for writing three sentences (or however many works for your students) about their quadrant. Come back as a whole and work on merging the four sections together to create a cohesive tale. Have you used this strategy with your class? I'd love to hear about it!